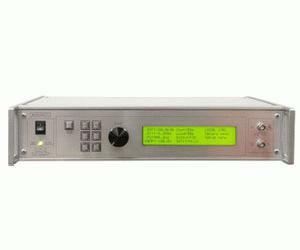 The AV-1010-B is a GPIB/RS-232-equipped general-purpose, 0 to +/- 100V pulser, offering 1 MHz operation, 10 ns rise and fall times, pulse widths from 25 ns to 10 ms, and a variable delay of up to +/- 1 second. When driving a 50 Ohm load, it can provide up to 2 Amps of current. With the use of accessory transformers, the output current can be boosted to 4 or 8 Amps. This model is ideal for both general lab pulse/delay generator applications, as well as high-current laser diode pulsing applications.